Prior to my team’s trip with Score in August 2016, I had never been out of the country and I had never been on a mission trip. I play basketball for the University of West Florida and as our first foreign trip as a team, my coach seized the opportunity of utilizing Score’s sports ministry in the Dominican Republic! Although my school is secular and some of the girls on my team may not have an active relationship with God, I appreciate my coach’s decision to encourage this trip for us. Well, appreciate is an understatement: I’m overly grateful that the Lord put on my coach’s heart to book this trip to Juan Dolio with Score. I’m constantly in awe of how God aligns so specifically actions and passions to glorify Him. To understand how pivotal and special this trip was I want to detail a little bit about my passions. I accepted Jesus in high school but not until recent years have I developed this deeper passion for telling people about his greatness. I have been leading FCA on my campus for 2 years now. I have a passion for basketball and it has been with me for 16 years now and I’ve gotten the chance to pursue basketball in college also. One more of my passions, that hasn’t always made sense why I love it or what I plan to do with it, is Spanish. Since middle school I’ve loved learning this language. Even when it didn’t make sense to minor in Spanish while having a major in Accounting, I followed what was on my heart and continued to take Spanish classes during college. I tell you all about my main passions to truly illustrate how God has used some apparent and hidden desires of my heart to serve Him. This short-term mission trip has a lasting impact on me today. 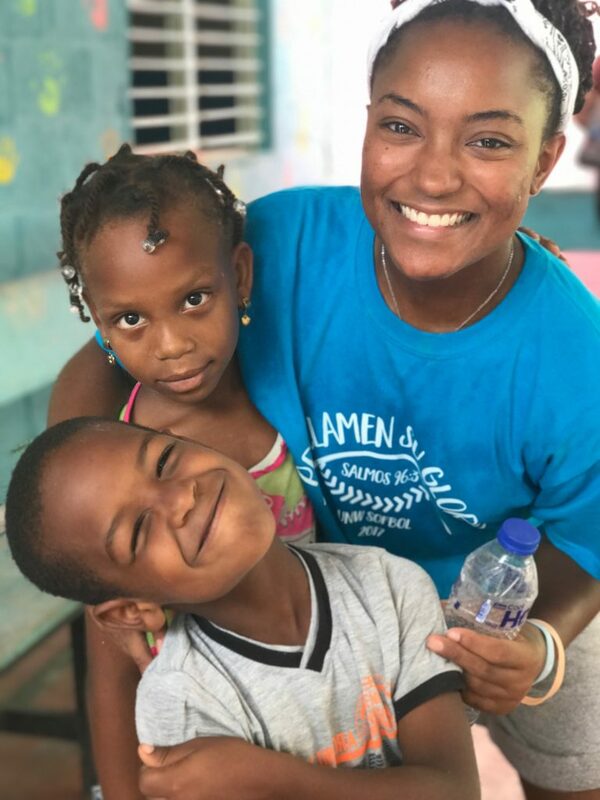 Being in the beautiful DR was a treat in itself, but being able to interact with locals and sharing kindness, testimonies, and fun in their villages and on their home basketball courts made the trip even more memorable. After having good times out serving and playing out in the Dominican community, we were able to come back to such a comfortable and cool living complex to relax. The Score staff at the complex is amazing also! (Ah, I could talk about so many different things about how great Score is but I can’t talk about all of them right now or this would be TOO long). To this day, my teammates and I laugh and share “aw” moments about our DR memories even a year later. It brought us so much closer as a team and I truly believe that our trip contributed to our successful (elite 8 finishing) season. One of my favorite memories is when one of my teammates came up to me after Score night when a missionary gave a message about Christ. She approached me with the concern that she’s been “missing” it, that she didn’t know if she truly had a relationship with God. This conversation put so much joy in my heart because even though I’m not sure if she was saved that night, it was cool to see the Lord stir something in her and that I was able to share with her what God put on my heart. Whether or not my teammates mentioned something directly about God’s hand on this trip, I know the Holy Spirit was moving during our time there. Leaving the DR after a week didn’t feel right. A week was way too short to already be leaving somewhere that instantly felt like home while doing stuff that instantly felt like a deep passion. Upon returning to the states, I inquired about returning to the DR to intern with Score this summer 2017. The Lord provided the finances for the internship through supportive friends and family. I was blessed to stay in the DR for 5 weeks learning and growing and serving within an amazing internship program. I learned so much about the missions field and also received precious discipleship. I will forever be grateful, and, God willing, I intend on returning in the future. Thank you Score for all you do to spread the gospel of Christ while cultivating an atmosphere of love. Hi friends, my name is Jade Davis and I’m from Atlanta, GA. I’m entering my 4th year of playing college basketball at the University of West Florida in Pensacola, FL. I continually find more beauty in following Christ & allowing Him be the Lord of my life. I have a passion for the Spanish language and Sports and Score has provided an amazing way for me to combine these passions in order to serve God. I visited the Dominican Republic for a week in August 2016 with my basketball team for a short term mission trip. In 2017, I returned to the DR to intern with Score for a month! If you have a #WhySCORE story send them to arden@scoreintl.org, we would love to hear them!